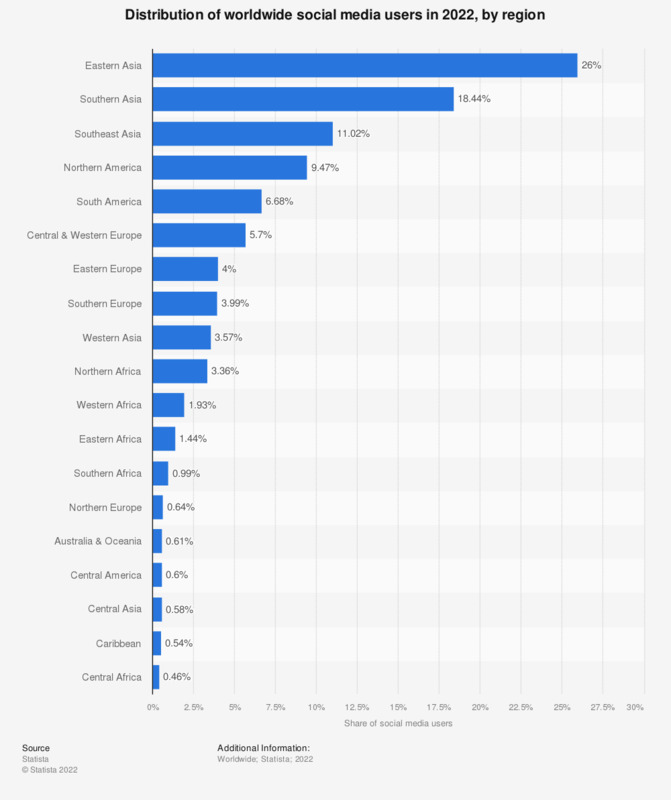 This statistic gives information on the distribution of worldwide social media users as of January 2017, by global region. During that period of time, 33 percent of worldwide social media users were located in East Asia, followed by 11 percent of users in Southeast Asia. Social media is a global phenomenon. The diversity and location of its users is widespread. As a result of the large audience who access social media, there are a number of ways in which its usage can be analyzed. The quality and availability of devices with internet access has grown substantially in the recent past. This has affected the way that internet users around the world are accessing their favorite websites, including social media. In the third quarter of 2014, social media access around the world was determined by the device used and the results were compared with those from the fourth quarter of 2012. The results revealed that whilst access via a PC and laptop dropped slightly, mobile and tablet usage grew. In the fourth quarter of 2014, 43 percent of global users accessed social media via a mobile and 20 percent via a tablet. A ranking of the world’s leading social networks as of November 2014, ranked by the number of active users, presents some interesting results. Unsurprisingly, Facebook was ranked first. However, in second place was QZone with 645 million active users worldwide. QZone which launched in 2005 and as of 2014 was only available in Chinese. Its high ranking amongst other social networks, reveals the influence and reach of Chinese social media users compared to the rest of the world. Social media is not as widely used in some countries in comparison with China and the U.S. However, the year on year user growth of social networks has been recorded in selected countries worldwide as of May 2014. Among BRIC countries, India experienced the most growth as its number of social networks grew 39.1 percent compared to the previous year. In comparison, Russia experienced an 8.3 percent growth in its social media users during the same time period.